My OSR Fantasy Hearthbreaker is near completion. The problem is that as I write the number of topics I think I should cover grows and grows. Where’s the Devotion & Religion chapter? And am I being too lazy providing spells for only the first 6 levels of the game? Maybe I should add an introductory adventure. The shopping list is too short. It needs rules to teach apprentices. What about coming up with new fighting techniques? And are six magic genres enough? Should I coalesce Divination and Mentalism? Should I add more special abilities to the Monster Generator? Is the Setting Development chapter usable and understandable, but even if it is am I doing the right thing not providing an example worked out? This got really uncomfortable, to the point where I found myself paralyzed and unable to continue. I don’t want to release a 200 page handbook next year, I want a 64 pages handbook this spring. The feature creep is caused by fear. Fear of writing the hard bits, those that are not really covered by other games, the unfamiliar territory. Those that might make you ridicule in front of people, the bits you haven’t playtested enough or that you tested too much. Things that might be too brave, or not brave enough. Enough with the navel-gazing and enjoy the due Joesky tax payment, which speaks more about AFG than many other things I could possibly write. Level: 1. Range: touch. Casting time: 1 turn. Duration: until next dawn. The Caster traces on the subject’s forehead the mark of a Demon God (a mystical sigil specific to each Demon God), which will appear glowing in a dark, purplish light. Undead, demons and creatures of evil will recognize the subject as a thrall of the Demon God and must succeed a stubborness save in order to being able to harm or impede the subject at all unless the subject harms them first. If the subject is currently in favour with the specific Demon God no save is allowed. Usually a grimoire covers details of at least one specific mark, so to learn other marks more grimoires must be sourced. After listening to authors feedback the OSR Conservation Process licence agreement for new uploads changed. While the positive feedback is not worth mentioning (but always appreciated), the negative feedback is important because it might highlight problems that need to be fixed. Negative feedback revolves mostly arount two terms of the licence: irrevocability and modification. Licence irrevocability means that a copyright holder can not unilaterally terminate the licence and take a document offline, making it unavaiable. The reason of the OSR Conservation Process is to stop this kind of loss to happen, without caring if the loss is accidental or deliberate. I believe allowing copyright holders to remove work is counterproductive to the aim of OCP and, well, there are plenty of websites ready to host your free RPGs (like RPGNow!) so authors can vote with their feet. The modification termn, enabling OCP to change the uploaded documents, is a completely different matter. This clause made uncomfortable a number of authors, and rightly so. It’s been included to allow OCP to transform files from a format to another (allowing creation of ebooks) but it can also mean that in theory OCP could replace all copyright and author notices and entitle them to some “Odo the Bishop of Bayeux”. Or swap all interior illustrations. And it’s been countering the OCP growth. So it’s been dropped. The “core” concept of the conservation process is to keep our gaming culture from vanishing. Automatic ebook support, while fancy, is not “core” and therefore it’s been dropped along the way. Finding out what’s important and what’s not is critical during critical times. The best work is the one that is never completed, let alone started. Such work lives, no, thrives and shines in our collective imagination, like the kingdoms explored by our younger selves, delving in big gardens, no adults around. Just the shadows of old, mighty trees, paths, stones and desire for adventure. I might have a stab at this. I’m not sure where I should start with it, the kind of stance to keep regarding violence, what to do with the dogs and with other kids. Heck, I might make it ultraviolent and slap a fat “18+” on its cover. And I couldn’t even publish it before July 2013 anyway. I’m not sure. Design decisions bring the matter of dreams down to earth, where it has to cope with limitations, inability, laziness, lack of interest and derision. Failure does not bother ideas. They’re just there, over the Hyperuranius, carefree, unfazed, timeless. Well, I can’t even find the first volume of “The University Bookshelf”, which is supposed to hold the story. I have no idea about who the author is, or what the story is about. It might be an excellent exercise anyway. 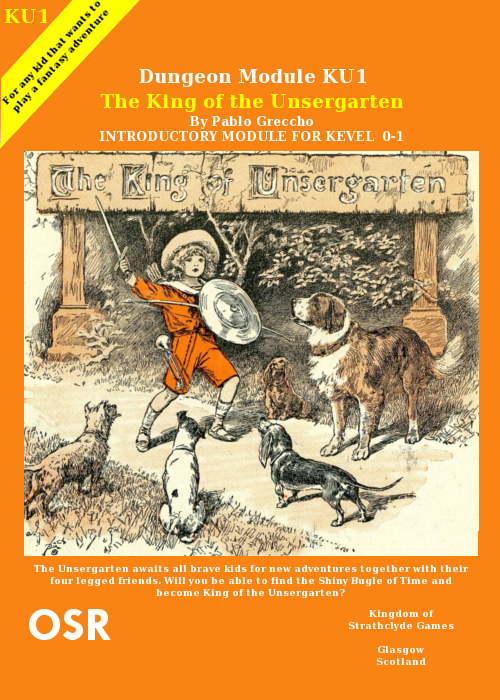 And yeah, I wish the title was about “Undergarden” but, sadly for you all grognards, it’s not: “Unsergarten” means “our garden” in German, and from my daft speculations it’s a tale of a kid becoming the king of his house’s garden, exploring it with his dogs.